Cut to 2019. 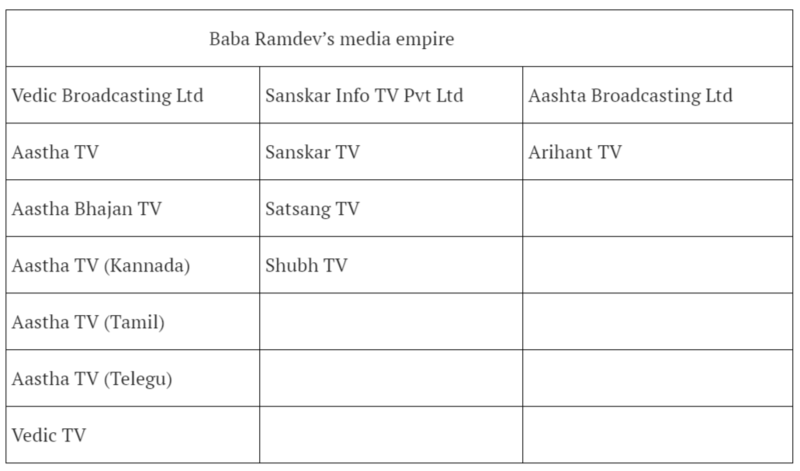 Ramdev has owned both Sanskar and Aastha TV for some time and has aggressively expanded the ambit of his media business since these two acquisitions. He has a controlling stake in and operates ten Hindu devotional channels. Similar to Patanjali Ayurved, Ramdev doesn’t own any stake in these companies and majority of the shares are owned by Acharya Balkrishna and companies controlled by him. Shubh TV was owned by Pittie Group, the entity which had earlier sold Sanskar Info TV to Ramdev few years ago. When contacted, Patanjali did not confirm the development and declined to participate in the story. Firstly, content is free for all devotional TV channels. Any other channel either produces its own content or pay for the content. For instance, a sports channel usually purchases the broadcasting rights for any sporting event. A general entertainment channel buys the television rights for a movie or invests its own money to commission and produce a TV show. Secondly, devotional TV channels are not dependant on advertising revenues. They sell advertising slots but it usually has a modest share in the company’s total revenues. While content is therefore free for these channels, one major area of expense for them is distribution cost, which they have to pay to DTH players and cable operators to distribute their channel, and teleporting fees for uplinking and downlinking their content on satellites. “The main revenue model for these channels is the babas themselves. Can you imagine an IPL organiser coming to a sports channel and is willing to pay for getting its matches on air? That becomes a reality in case of a devotional TV channel,” the senior industry insider added. It is invariably a paid slot that is purchased by a spiritual guru or an advertisement slot bought by any brand to promote its product to the audience. Technically-speaking, everything on a devotional channel is branded content. Spiritual gurus, in particular, are eager to pay the channels for promoting their brand.